The WAM Foundation was founded in 2009 by Kirk and Lyndsey Vidra after their lives were significantly impacted by melanoma. While Kirk's story is one of survival, too many melanoma stories don't end the same, and too many fathers, mothers, sons, daughters and friends are lost. Kirk and Lyndsey realize how truly blessed they are and founded The WAM Foundation in hopes that one day all melanoma stories end with survival. The WAM Foundation's mission is to raise public awareness of melanoma, to educate the public about prevention methods, to promote screenings for early detection, and to provide funds for research of effective treatment methods and ultimately a cure for melanoma. Since its formation The WAM Foundation has donated over $130,000 to The Ohio State James Cancer Hospital and Solove Research Center in Columbus, Ohio. 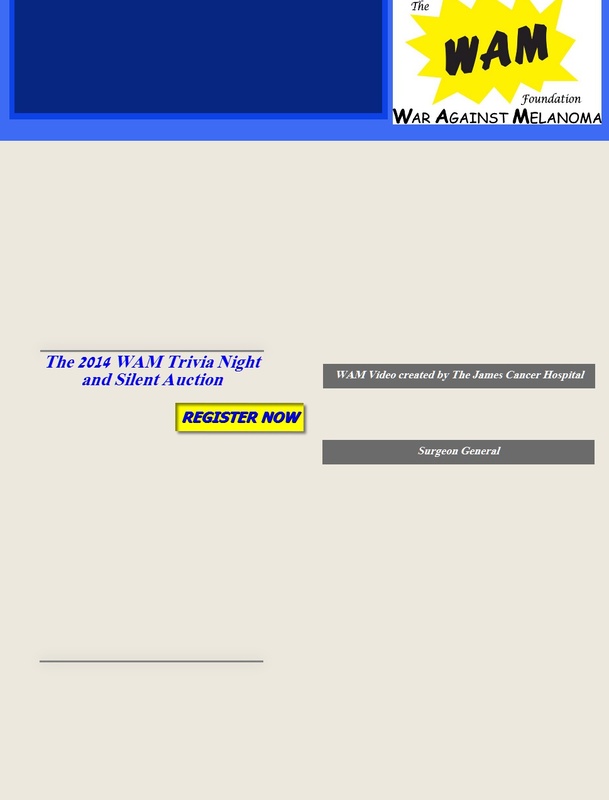 Since its formation in late 2009, The WAM Foundation has donated over $130,000 to The Ohio State James Cancer Hospital and Solove Research Institute in Columbus, Ohio for melanoma research and related purposes. Thanks to all who have supported us and joined the War Against Melanoma! Once again WAM was a benefitting charity for the 2014 Columbus Crawl for Cancer. Thank you CFC for giving us the opportunity to raise melanoma awareness and funds for melanoma research!